Member of the Louisiana Pest Management Association. 5 time winner of the "Reader's Choice Award" for Best Pest Control Company. 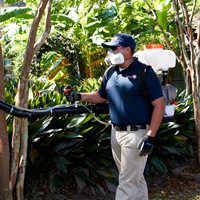 LaJaunie's Pest Control offers a variety of pest managment programs for your home and business. We have the latest technology, and the safest products available in the pest control industry. We have the highest standards for service, safety, and complete customer satisfaction. Call today to find out more about our services and how to protect your home from roaches, rats, mice, mosquitos, and termites. We also offer green, chemical free, and organic pest control options. We will resolve your pest problem in a quick, affordable, and efficient manner. As always, we offer same day service and a money back guarantee! Denzell always does a great job! He is extremely knowledgeable and takes time to explain what he"s doing and why. Very professional! Awesome service, friendly staff and very punctual. I would recommend to anyone! very happy with service. will recommend to othets. The young Guy Mathew was very thorough, Professional, and very friendly. He was also Informative when I asked questions about chemicals they use. Would highly recommend for anyone looking very good people and gets job done in timely manner. Thanks Lajaunies! You guys are awesome! We are thrilled with the service we received from Lajaunie's. All the questions we had were answered by the service technician. He was very nice and helpful. Definitely recommend them! Everything is great at this time. Fast and considerate. Very thorough and honest. Friendly service, fast, and efficient. Great service! came within the first hour of the time slot I was given and was service was quick and painless! Very satisfied with the flexibility of Lajaunie’s Pest Control and I would recommend if you are looking for pest control service. First, we were able to get service very quickly. Our technician, Devron was very knowledgable, professional and super helpful. I am glad he is our go to guy. Excellent service, and great people to work with! I’ve had the opportunity to work with Lajaunies Pests Control on several occasions. Their employees are professional, personably, dependable and kind. Their prices are a lot cheaper than their competitors. I will continue to use their services in the future along with recommending them to my family and friends. I highly recommend their services for pests control. The technician did a wonderful job. Great job! Very professional, on-time, cost efficient! My only negative, fix the review so that I can answer on my phone in Safari without “copy and paste” to Firefox. I realized tonight that my answer was not going thru in Safari. Service was great! Edward was super polite and professional! Excellent service timely and efficient. Morgan was friendly and very accommodating. Always friendly, prompt, and great service. Great service. Arrived shortly after I received notification that the technician was on his way. Very cordial and friendly. I am very please with the service we received. We had Terminix and was very dissatisfied. I would let them know of a problem & the tech would tell me it would be an additional charge it wasn’t included in our monthly service. I am so glad we switched. Thank you so much! One time is all it took!!!! Amazing ! Can’t say thank you enough ! Seriously thank you! people are great appointments are on time and you cam]n be sure they are going to be there. if they need to reschedule or I need to reschedule I am called. I had a rodent problem I was guaranteed in 2eeks they would be gone and in that time frame they were gone. I have referred them to all of my family and friends. Responded quickly to my needs. Very courteous and thorough. Showed up at appointed time. They make u feel valued as a customer. I have reviewed you several times. Please do not send me this again! Thanks.